At this point you should have Python installed and working via Anaconda. Now that you have the tools you need to run Python code, let’s get you some tools for writing it. As you’ve now seen demonstrated in class, the main product programmers output — raw computer source code, is in essence a block of text in a specific language that adheres to very strict rules. To write code, all you need is a program that lets you write text and save it. More specifically, it needs to be plain text — only characters, and no formatting. Word, OpenOffice, and Pages are rich text word processors; they are not suitable for writing code. So are TextEdit, WordPad, and Notes even though they’re simpler, they still emit rich text rather than plain text. You could in theory use a stripped-down basic text editor like Notepad or the plain-text mode in TextEdit. But in practice, you’ll be much better off using an editor specifically designed for software. Why? Because a good code editor can do a lot for you besides save text. In the very beginning, the only references to language and code for a given programming lanaguage came in the form of thick books, allowing the user to enter sample programs by hand straight into a console on the computer. There was little room for error and essentially no help from the computer. Syntax highlighting: You may have noticed that the code in the demonstrations in class is in color. Those colors were provided by the IDE, which recognizes different parts of a program and formats them appropriately. This makes it much easier to read and understand your code. Auto-indendation: In Python, the indentation of lines of code is crucial to their meaning. A good IDE can keep you from making indentation mistakes by choosing the right default indentation for you. Auto-completion: An IDE that knows about your project can recognize when you’re starting to type the name of a function and provide appropriate suggestions, saving you time and sparing you typos. Code browsing: An IDE can also help you keep track of a complex project. Where is this function defined? What does it do? The IDE can show you. It can also provide clear summaries of how your project is organized and its pieces fit together. Debugging: An IDE can provide powerful features that help you walk slowly (or quickly) through your program as it runs so that you can understand exactly what it’s going as you try to track down abug. Instrumentation: An IDE can also help measure and profile your code’s performance, telling you where it’s spending its time and helping you make it run more efficiently. Different programmers, different companies and different organisations often have their own standardized choices for what IDEs to use, and as such new employees often spend significant time onboarding in order to get used to these chosen tools. The benefit is when everyone works in the same IDE and environment, it’s very easy to rule out bugs and issues related to a given environment or IDE as well as facilitating collaboration between developers. The IDE we have chosen for this course is called Atom Text. We think it strikes a nice balance of being both powerful and easy-to-use. You may use any other text editor or IDE you feel comfortable with, but be aware we will not officially provide help with configuration or any issues pertaining to your choice. Atom is an open source text and code editor from the folks at GitHub. The interface is very straightforward as it lacks many of the more advanced code analysis tools that come by default with other IDEs, and thus make Atom a very good choice when first interfacing with code. and press the “Download for XYZ”, where XYZ will be your current operating system. After downloading, proceed to install Atom as you would any other program (i.e. on Windows -> run the installer, macOS -> drag and drop to “Applications”). Congratulations! 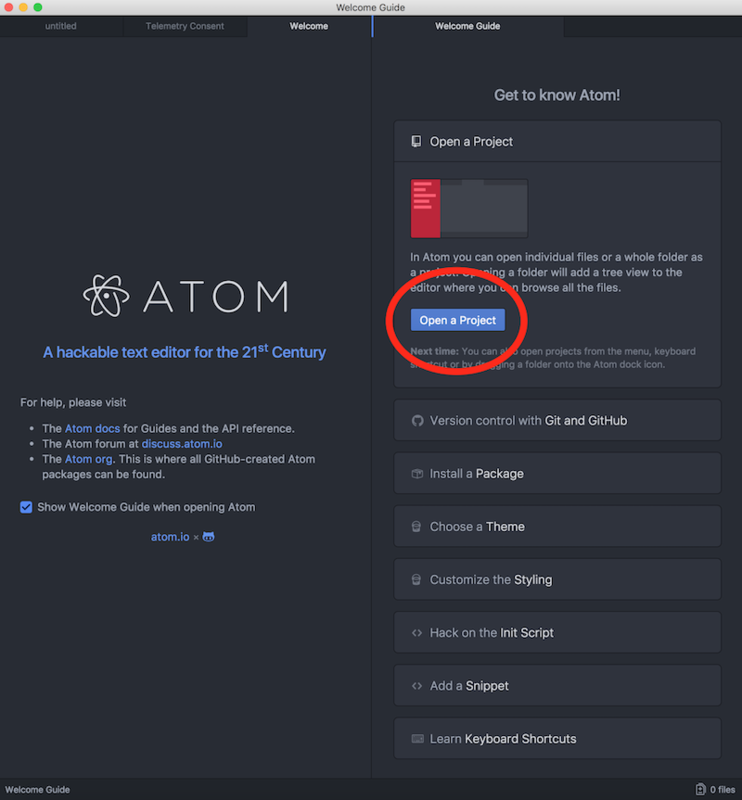 You now have Atom Text installed and are almost ready to move on! 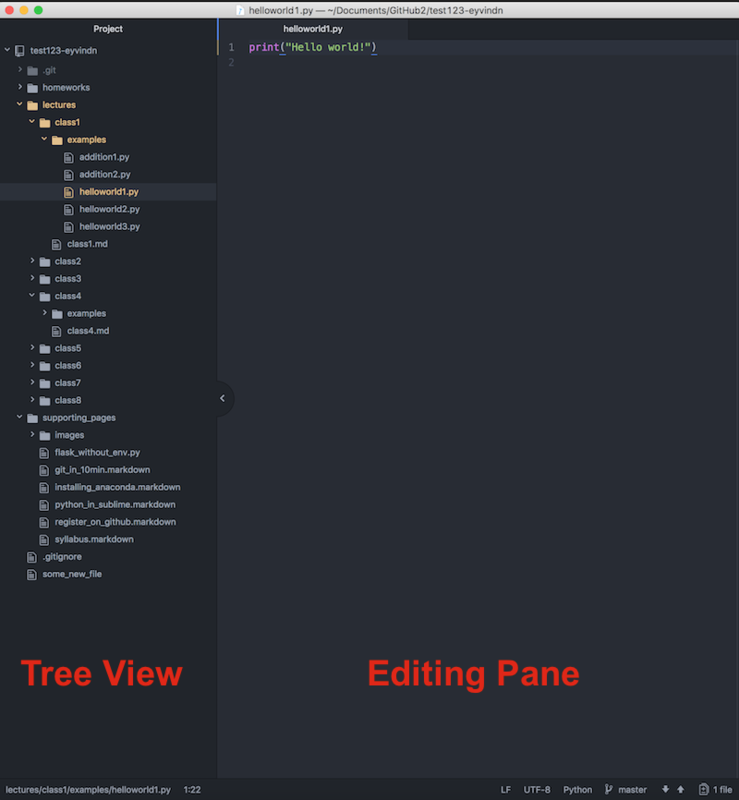 You can use Atom like any other editor (e.g., Word, Pages, TextEdit, or Notepad); it has all of the usual commands to New, Open, Save, Save As, and Close files. But there’s another way to use it that can sometimes be convenient if you’re working on more than one file: project view. To use it,, press the “Open Project” button that you see at the top of the available things to do. Then browse to any folder om your computer. Now, you should see the contents of this folder show up on the left in a tree view (i.e. each subfolder is further indented from its parent), and clicking on any of the files in this tree view will open that file for editing. Once you have made any changes, simply do Command+s or Ctrl+s to save the file. To create a new file, use the keyboard shortcut Command+n or Ctrl+n, or right click and select “New File” in the tree view.